Together with partners and contractors, Spilborghs unveiled plans for the 69-field Rocky Mountain Sports Park at a groundbreaking Tuesday afternoon. The park is expected to open in 2019. Ryan Spilborghs at the groundbreaking of Windsor’s new sports park. As has been previously announced, the sports park is being built to play host to amateur teams from around the nation and world, including teams composed of players with disabilities. Speaker after speaker touted the economic benefits of the development, to be located on 490 acres of land on the northwest corner of Colorado Highway 257 and Harmony Road north of the developed city of Windsor. The park is close to Denver International Airport, will use existing infrastructure at nonpeak times of the day, will cater to athletes year around because of both indoor and outdoor amenities, will include a “Miracle Field” for athletes with disabilities, will be built using solar and wind energy resources and will recycle water. 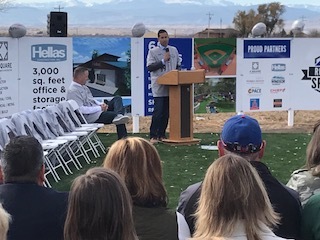 The park will include on-site hotels and restaurants for the convenience of traveling athletes and their families, the speakers said. But the impacts will extend far beyond. Dan Rascher, who performed the economic impact study for the developers, said he estimates that traveling teams will spend $40 million to $50 million just at the facility itself, plus what they will spend at hotels, restaurants and other businesses in the region.